Our cartographic team partnered with the University of Wyoming’s Migration Initiative (WMI) to produce the Wild Migrations: Atlas of Wyoming’s Ungulates to help draw attention to the amazing journeys of Wyoming’s migratory ungulates, to synthesize disparate spatial data on migration, and to elevate awareness of this ecological phenomenon as a means of advancing conservation and management efforts. This is the world’s first atlas dedicated to telling the ungulate migration story. The Atlas draws upon a wealth of knowledge built through several decades of intensive study by biologists in the region. Facing pages in the Atlas cover more than 70 migration topics, ranging from ecology to conservation and management – all of which are illustrated with visually stunning maps, graphics, and photographs. Page pairs illustrate topics such as the plight of migratory bighorn sheep in the Tetons, the importance of Yellowstone for elk summer range, and the discovery and conservation of the longest mule deer migration in the world. The Atlas is a data rich, state-of-the art, easy-to-read authoritative reference book that will educate and engage regional and national readers. 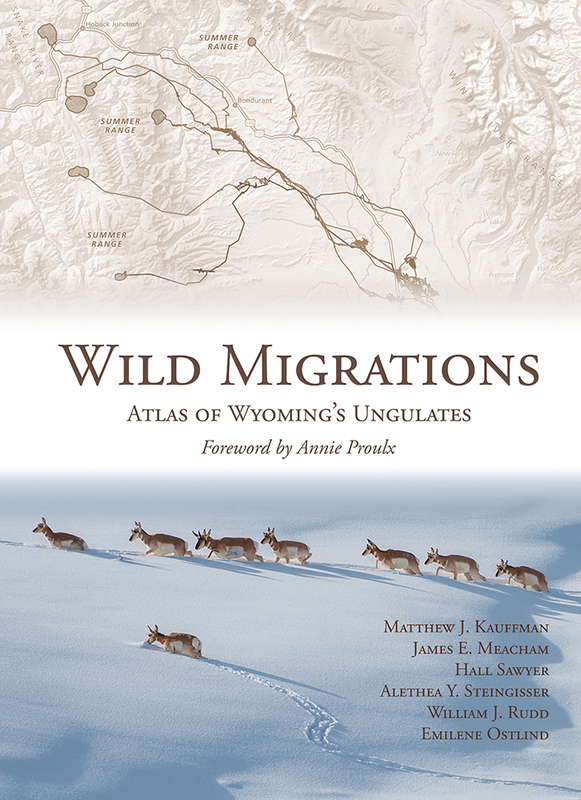 The editorial and production team of Wild Migrations includes Matthew Kauffman (senior editor), James Meacham (cartographic editor), Hall Sawyer (associate editor), Alethea Steingisser (production manager), Matt Hayes (spatial analyst), Bill Rudd (contributing editor), and Emilene Ostlind (text editor). Wild Migrations was released in October 2018.